Healthcare facilities across North America are experiencing a shortage of several bupivacaine formulations affecting analgesia and anesthesia care, particularly for obstetric services. The editorial provides evidenced-based guidance regarding alternative analgesic and anesthetic management strategies for the obstetrical patient to address both bupivacaine and other drug shortages that may occur. Other topics addressed include facility preparedness for drug shortages, safe drug preparation, and continued shortage monitoring and reporting. Read the article and visit www.aana.com/bupivacaineshortage for more resources. The Anesthesia Patient Safety Foundation invites all U.S. and Canadian anesthesia professionals in training to submit a video abstract that demonstrates their program’s work in patient safety and quality improvement initiatives. The first and second place videos will receive financial awards of $1,000 and $500, respectively. The winning entries also will be showcased on the APSF website. Learn more. Deadline for submissions is August 31, 2018. Read NFPA 3000 on the National Fire Protection Association’s website. Did you know that your employer can settle a claim on your behalf without your consent? Ensure you have protection when you need it with a policy that supplements the coverage provided by your employer. Learn more. At Seattle Children's Hospital, Anisa Manion, MSN, CRNA, ARNP, has a special trick up her sleeve when it comes to calming kids down during the pre-surgery process. After surgery, each patient gets to take the bag home as a souvenir. Read more. Editor in Chief Chuck Biddle, PhD, CRNA, recounts the latest articles from the August 2018 issue of the AANA Journal, and why they are important for nurse anesthetists to read. This article reviews the essentials of quantitative monitoring of NMBDs, a standard that is likely in the making. In their QI project report, they demonstrate the value of education and training on making the use of NMBDs both more effective and safer. This elegant, single-site study of a highly clinical relevant patient population documents a very high rate of undiagnosed OSA in patient undergoing joint replacement surgery. The authors detail the research findings in terms of essential clinical-care considerations. The authors performed a comprehensive narrative review on the use of IV lipid emulsion to treat a potentially catastrophic complication of using local anesthetics in the care of a patient. Education of emulsion use, storage considerations, and practical considerations make this a must, patient-safety read. A report on a most important domain: how do we access information and use it in our clinical practice? This first-of-its-kind work in our Journal, will, according to the authors, assist the NBCRNA in studying which types of resources are most appropriate and useful to CRNAs in preparing for examination purposes, but also chronicle how we use materials in our professional lives. The authors, as part of the AANA Closed-Claims team, provide us with a description of the process of closed-claims analysis and provide sobering, negative outcome cases that illustrate the power of this type of methodology. By identifying common themes in the genesis of patient demise, we can develop education and practice strategies that may help prevent similar occurrences in others. An excellent Journal Course (CEU offering) is presented, regarding the rational use of non-opioids in clinical care. In this day and age of epidemic abuse of opioids, the course seems most timely. Opioids, once regarded as first-line interventions in the clinical care of patients, are undergoing an evolution in perspective as new strategies and use of both old and new drugs assume a more prominent role in our anesthetic practice. The authors, in a brilliant guest editorial, illuminate the terrain of drug shortages, with an emphasis on the OB-suite where a staple in that domain, bupivacaine formulation, experienced a shortage. The importance of anticipation, recognition, planning and education is essential in dealing with such a circumstance. These authors help us better appreciate the importance of systematic adaptation to drug shortages that have significant patient implications. Does It Make Financial Sense to Become a CRNA in 2018? When it comes time to choose a career path or shift occupations, one of the top considerations is financial. Will this career provide the income I desire? Is it worth the investment of time and money to get the education I need? The same questions apply to the medical field, specifically the job of a CRNA. We may be drawn to jobs like that of doctors, nurse anesthetists, and other medical professionals because of their lucrative salaries. But the path to receiving these high-paying positions is comprised of expensive tuition, lost wages while in school plus delayed higher earnings. 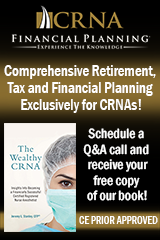 Is it financially worthwhile to become a CRNA today? Looking for a perfect family getaway at a budget-friendly price? You do have options beyond the staycation or the grandparents’ house for a getaway. With a little creativity and planning, you can cut vacation costs without missing out on any of the fun. This planning guide offers budget-friendly ways you can enjoy a family vacation. Back to School Savings for AANA Members! Because you're a member of the AANA, you're entitled to members-only discounts at Office Depot and OfficeMax! Your discount can be used for business or personal purchases of thousands of eligible program items such as ink and toner, paper, pens, cleaning and breakroom supplies, furniture, and lots more! Visit: officediscounts.org/aana for your discounts! Exposure to general anesthesia is a concern in infants needing postnatal interventions to treat prenatally diagnosed lower urinary tract obstruction (LUTO). In response, investigators explored whether a prenatal staging system could predict the number of anesthesia events in this population. The retrospective, prognostic study looked at prenatal clinical records for 31 patients with the condition and postnatal records for 21 of them. The combined data revealed a meaningful difference in anesthetic exposures based on disease stage. Babies with Stage III prenatal LUTO underwent 6.7 encounters in the first year of life, versus 3.7 for Stage II diagnoses and 1.6 for Stage I patients. Univariate analysis also showed that older gestational age at birth was associated with fewer anesthesia events by age one year. The Level IV evidence is reported in the Journal of Pediatric Surgery. From "Surgical Interventions and Anesthesia in the 1st Year of Life for Lower Urinary Tract Obstruction"
Patients experienced poorer recovery outcomes after elective foot and ankle surgery if they were overly anxious beforehand, new findings show. The retrospective investigation focused on 88 patients: 25 who presented with more preoperative emotional distress and 63 who exhibited less based on the PROMIS anxiety rating system. Researchers compared patients' PROMIS scores before and after surgery; and they also evaluated pain interference, physical function, and depression levels at both time points. The results indicated that there was more preoperative pain and worse preoperative function in patients with elevated emotional stress. Postoperative improvement in pain and function was comparable for all patients, but individuals with higher PROMIS scores before the procedure reported more pain and less function six months post-surgery than lower-stress counterparts. "Because patients in the higher anxiety group had levels of pain one standard deviation above the general population, patient counseling may be necessary to help them understand their results,” Sandra Klein, MD, reported recently at the American Orthopaedic Foot & Ankle Society Annual Meeting. From "Preoperative Anxiety Linked to Higher Postoperative Pain After Foot, Ankle Surgery"
Researchers say a cuff leak test (CLT) is a viable option for assessing the potential for airway obstruction before extubating mechanically ventilated adults, but only under some circumstances. The finding is based on a meta-analysis that included 21 studies and 3,772 patients. Researchers found that, based on its high specificity (89 percent), the cuff leak test accurately predicts post-extubation laryngeal edema in the presence of a cuff leak. To the contrary, moderate sensitivity (69 percent) may limit the test's ability to rule out the likelihood of an obstruction in the absence of a cuff leak. Subsequently, the researchers admit that care providers may lean toward other alternatives with better sensitivity—although they still see a role for CLT. "Given the considerable burden associated with extubation failure, it is useful and reasonable for a cuff leak test to rule in high-risk patients to further prepare for a safe extubation," they conclude. "Our study thus supports the idea of performing a cuff leak test," as directed under 2017 American Thoracic Society and American College of Chest Physicians clinical practice guideline recommendations. The findings were presented at the 2018 annual meeting of the Society of Critical Care Medicine. From "Cuff Leak Test Good at Ruling in Post-Extubation Airway Obstruction"
Ketamine, an anesthetic, has been shown to curb depressive symptoms in youths who do not respond to traditional interventions, new evidence suggests. Researchers at the Mayo Clinic, working with collaborators at the University of Minnesota, studied a small group of patients aged 12–18 years who did not get relief from two previous antidepressant regimens. Participants received half a dozen ketamine infusions over the course of a fortnight. Clinical response and remission were achieved in five of the 13 patients, and Children's Depression Rating Scale scores for the group as a whole declined 42 percent on average. Moreover, three of the five patients remained in remission after six weeks. The investigators say the results, published in the Journal of Child and Adolescent Psychopharmacology, offer hope for ketamine as a potential treatment for adolescents with treatment-resistant depression (TRD). Recent studies have demonstrated the drug's efficacy among adults, but little was known until now about the effect in younger patients. "I think our results show promise for this population, however this study is just a beginning," said Mark Roback, a pediatrics professor at the University of Minnesota. "The study serves to point out the need for further, rigorous, study designed to answer the many questions that remain about ketamine for TRD, such as optimal dosing and route of administration, dosing interval and treatment length, and long-term effects—just to name a few." From "Ketamine Shows Promise as Treatment for Adolescents with Depression"
Study authors at Boston's Beth Israel Deaconess Medical Center (BIDMC) have just published the findings of a large-scale study on risk factors associated with prolonged opioid use. Their meta-analysis—incorporating 37 studies and more than 1.9 million patients—identified depression, back pain, and previous drug use as strong predictors of continued use of pain medication longer than two months after an operation or trauma. Specific prescribing patterns, types of surgeries, and patient traits also elevated the odds of long-term opioid use, according to the report in the Journal of Bone and Joint Surgery. Women, for example, are more likely than men to be prescribed opioids; and patients receiving workers' compensation benefits had the worst track record for long-term opioid use. "Understanding the pooled effect of risk factors can help physicians develop effective and individualized pain management strategies with a lower risk of prolonged opioid use," according to Ara Nazarian, MD, a principal investigator in the Center for Advanced Orthopaedic Studies at BIDMC and an associate professor of orthopaedic surgery at Harvard Medical School. From "Researchers Find Conditions, Characteristics That Raise Opioid Misuse Risk"
University of Wisconsin researchers scrutinized hundreds of randomized controlled trials published in an effort to assess the value of preemptive analgesia for patients undergoing minimally invasive gynecologic surgery (MIGS). Their search of the PubMed, Cochrane, and Embase registries through February 2018 yielded 324 English-language studies with human participants that met their criteria. Based on the evidence from those investigations, preemptive blocks—including paracervical, TAP, and pudendal—offered the most consistent reduction in MIGS postoperative pain. Additionally, the cost-benefit ratio was highly favorable in most cases. Administering anticonvulsants, ketamine, and dexmedetomidine ahead of a procedure also alleviated pain afterwards and curtailed opioid demand; but these drugs are not recommended because of their associated adverse effects. Meanwhile, preemptive analgesia delivered through dexamethasone, acetaminophen, and nonsteroidal anti-inflammatory drugs had a modest effect on MIGS postoperative pain control. Despite the encouraging findings, the investigators conclude that additional high-quality work is necessary to identify more definitive methods of preemptive pain control in this setting. From "Preemptive Analgesia in MIGS"